This study examines the influences on fluid flow within a shale outcrop where the networks of two distinct paleoflow episodes have been recorded by calcite-filled veins and green alteration halos. Such direct visualization of flow networks is relatively rare and provides valuable information of fluid-flow behavior between core and seismic scale. Detailed field mapping, fracture data, and sedimentary logging were used over a 270 m2 (2910 ft2) area to characterize the paleo–fluid-flow networks in the shale. Distal remnants of turbidite flow deposits are present within the shale as very thin (1–10 mm [0.04–0.4 in.]) fine-grained sandstone bands. The shale is cut by a series of conjugate faults and an associated fracture network, all at a scale smaller than seismic detection thresholds. The flow episodes used fluid-flow networks consisting of subgroups of both the fractures and the thin turbidites. The first fluid-flow episode network was mainly comprised of thin turbidites and shear fractures, whereas the network of the second fluid-flow episode was primarily small joints (opening mode fractures) connecting the turbidites. The distribution of turbidite thicknesses follows a negative exponential trend. which reflects the distribution of thicker turbidites recorded in previous studies. Fracture density varies on either side of faults and is highest in an area between closely spaced faults. Better predictions of hydraulic properties of sedimentary-structural networks for resource evaluation can be informed from such outcrop subseismic scale characterization. These relationships between the subseismic features could be applied when populating discrete fracture networks models, for example, to investigate such sedimentary-structural flow networks in exploration settings. Shales, mudstones, or mud rocks (shale differentiated by higher fissility) account for approximately two-thirds of the sedimentary rock covering the Earth’s surface (Aplin et al., 1999). Many industries require a solid understanding of the hydraulic properties of shales, for instance, as top seals for conventional oil and gas reservoirs or CO2 storage targets (Gaus, 2010), reservoirs for unconventional hydrocarbon production (Gale et al., 2014), geological disposal sites for radioactive waste disposal (Kim et al., 2011), and geothermal resources (Willmot Noller and Daly, 2014). However, there are issues with being able to capture their permeability properties at the appropriate scale and then being able to upscale to a whole reservoir perspective. Shales typically have low permeability (Dewhurst and Siggins, 2006; Aplin and Macquaker, 2011; Armitage et al., 2011) and must be stimulated using hydraulic fracture treatments for hydrocarbon production. To enhance production, it is advantageous if the hydraulic fractures connect the wellbore with higher permeability structures in the rock. Natural fractures, even if sealed, can be reactivated during treatments, and if open fracture networks are present, fluid flow will be strongly controlled by the linked natural and stimulated fracture network (Gale et al., 2007). Shale units can also be interbedded with coarser material, such as siltstone or sandstone, caused by depositional cycles such as turbidite flows (figure 2.13 in Bouma et al., 1962). However, the difficulty of making in situ observations of the effects of thin, high-permeability beds (sometimes referred to as “thief zones” in thicker units) has hampered efforts to understand their effect on flow within a larger network. Fracture networks in tight rocks may be beneficial because they can increase completion quality in shale gas and tight gas wells (e.g., Glaser et al., 2013) or may be detrimental by providing leakage pathways (Gaus, 2010). Fault zones in sedimentary environments have been extensively studied for their flow properties (Lehner and Pilaar, 1997; Yielding et al., 1997; Davatzes and Aydin, 2003; Eichhubl et al., 2005; Dockrill and Shipton, 2010) because of the role of faults in compartmentalization of reservoirs and hydrocarbon trapping. Faults can also provide conduits for along-fault flow as evidenced by diagenetic alteration surrounding fault-related fractures (e.g., mineralization-induced color changes [Eichhubl et al., 2009], mineralization within fractures [Zhao et al., 2007; Kampman et al., 2012], modern springs [Fairley and Hinds, 2004], and ancient CO2-rich springs in the form of travertine mounds [Burnside et al., 2013]). Seismic techniques in places permit direct visualization of fluid moving through faulted shales (i.e., seals) in the subsurface (Haney et al., 2005; Cartwright et al., 2007), but typically the structures controlling flow on the scale of the well are too small to be captured in reflection seismic data. However, cores from wellbores may only capture a small part of the permeability network and may not be representative of the larger scale. Although many studies examine matrix permeability of core samples (e.g., Bolton et al., 2000; Aplin and Macquaker, 2011), these are not representative of the bulk permeability of a fractured or faulted shale. Some studies have focused on fault-related fractures, whereas others include the widely developed opening-mode fractures that occur in panels of rock away from faults (e.g., Evans 1994; Gale et al., 2007; Lash and Engelder 2009). Outcrop analog studies of fault and fracture systems in shale can be a useful scale bridge between core and seismic but are hampered because of the susceptibility of the rock to erosion leading to poor-quality exposures. We investigated an exceptionally well-exposed shale unit hosting very thin (<1 cm [<0.39 in.]) sandy remnants of distal turbidite flows (Ingham, 1978) and that is cut by subseismic scale faults. Distal regions of turbidite systems have previously been studied to understand their depositional environments (e.g., Crimes, 1973) or the influence of turbidite sheet connectivity on hydrocarbon migration (Walker, 1978). They are generally expected to form seals to hydrocarbon flow because any thin coarser-grained layers lack vertical connectivity. 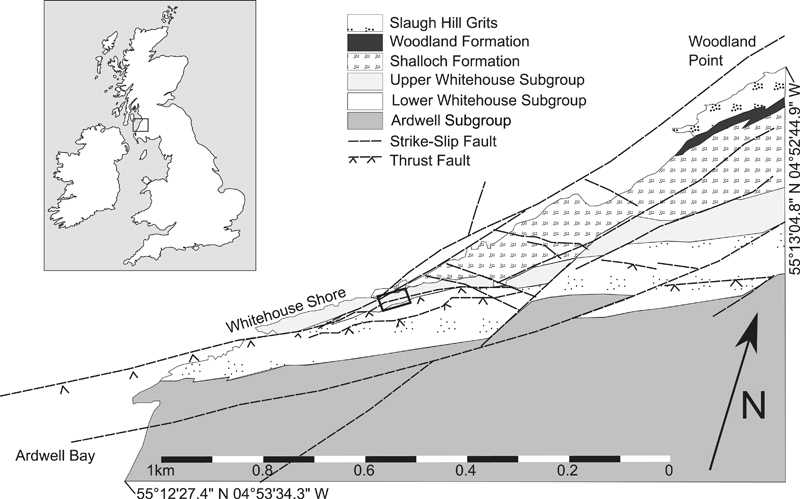 We examine whether the sealing potential of shales in such distal turbidite regions is compromised by the presence of vertically connected subseismic fault and fracture networks in addition to the presence of rare injectites. Evidence is presented (collected from a distal part of a turbidite system) of two separate fluid-flow episodes identified by the presence of mineralization and chemical alteration halos. A detailed study of the small-scale sedimentary and structural features shows that they interact, forming connected fluid-flow networks through the mudstone. The results form the basis for a discussion about data collection strategies for aiding the detection and prediction of such networks in an applied setting. The study area (Figure 1), known as the Whitehouse Shore, is located in southwestern Scotland, 3 km (2 mi) south of the town of Girvan. Interbedded, steeply dipping beds of sandstones and shales are exposed in the intertidal zone below a raised beach. The shale unit of interest is swept clear of debris with each tide, leaving the rock surface smooth and accessible for approximately 2.5 hr either side of low tide. Figure 1. Geological map of the area surrounding Whitehouse Shore and the field site. Rocks are Ordovician and Silurian and young to the northeast. Map from Lawson and Weedon (1992). Field site is located at coordinates 55°12′49.47″N 004°53′18.25″. The study area was chosen for two main reasons: (1) the unusually excellent exposure of mudrocks has undergone very low-grade metamorphism, increasing resistance to erosion and therefore preserving the outcrop, and (2) there is clear evidence of two distinct fluid-flow episodes preserved in the rock. This site, the Whitehouse Shore, is a Site of Specific Scientific Interest (a United Kingdom classification of strict environmental and geological protection), and therefore no tools are permitted for sampling; all samples were from loose rock. The Whitehouse Shore exposes Upper Ordovician to Silurian sedimentary rocks (Figure 2) deposited within a submarine fan system that developed in a fore-arc basin related to the closing of the Iapetus ocean (Ince, 1984). The Ballantrae Ophiolite, related to this closure, is located several miles to the south of the field site. Sedimentology suggests sourcing from a magmatic arc with paleocurrent indicators showing sourcing from the northwest (Hubert, 1966). Figure 2. Geological map of the Whitehouse Shore (adapted from Lawson and Weedon, 1992). The area highlighted by the thick black outline is the area of particularly good exposure used in this study, which is mapped in detail in Figure 9. Bedding dips 84°–88°NW and becomes younger in this direction. Earlier thrust faults are offset by later strike-slip faults. At this field locality, graywackes, sandstones, siltstones, mudstones, shales, and thin limestones were deposited in waters greater than 400 m (>1300 ft) deep in the Late Ordovician (Lawson and Weedon, 1992). Significant variations in sediment thicknesses of the underlying Benan Conglomerate suggest that the basin was bounded by active normal faults that controlled sedimentation on the fan (Ingham, 1978). The Myoch Formation of the Upper Whitehouse subgroup is composed of predominantly green shale at its base overlain by red shale containing thin (often <1 cm thick [<0.4 in. thick]) sandstone bands. The Upper Whitehouse subgroup has been interpreted as deposited in a deep-shelf and ocean-floor setting distal to the submarine fan (Ingham, 1978). This study focuses on the red shale member of the Myoch Formation, where the digenetic features are most clear. Figure 3. Orientations of different fluid-flow controlling features. The tick marks on the perimeter as seen in (C) show the trend of the largest fault in the field site (280°–100°). (A) Bedding. (B) Thrust faults. (C) Shear fractures. (D) Joints. max. = maximum; n = number. To characterize the shale, grain size and composition were estimated from point counting on scanning electron microscopy images. The grain size of the shale ranges from clay-to-rare grains of very fine sand (<125 μm–63 μm), although most of the grains are silt (<63 μm) or smaller with approximately 50% of the grains being part of the clay fraction. The mineral composition of the red shale is 10% quartz, 63% feldspar, with biotite, chlorite, and metal oxides making up the remaining 27%. The thin sandstone bands within the red shale have steep dips of 84°NW–86°NW and have tightly clustered strikes of northeast–southwest (Figure 3). The sandstone grain size ranges from 17 μm (medium silt) to a maximum measured grain size of 148 μm (medium sand). No grading of grain size was observed in any of the sandstone bands. Point counting gives a clay content of the sandstone bands as 20% and the composition of the clasts as 56% quartz, 12% feldspar, with the remaining 32% composed of biotite, chlorite, and metal oxides. The partial replacement of some biotite grains with chlorite indicates that the shale has undergone very low-grade metamorphism. fdfbbacbfqfcwssfxytxvdxweeaywsve Figure 4. Sedimentary transect showing location and thickness of sandstone bands, including those with a surrounding green halo. A total of 69 sandstone band thicknesses were measured along a scan line perpendicular to the bands. Figure 4 shows a graphical representation of the sedimentary scan line. A digital caliper was used for their measurements, and a histogram of the thicknesses is presented in Figure 5. Almost all sandstone bands were less than 1 cm thick (<0.4 in. ), but the thickest was significantly more at 7 cm (2.8 in.). Sandstone bands less than 1 mm (<0.039 in.) may be underestimated because of the difficulty of identifying such small features in the field. The distribution of sandstone band thicknesses is well described by a negative exponential distribution (Figure 5). The sandstone bands represent a 3.6% net-to-gross of the total thickness of the red shale; similar ratios (2% sandstone) have been found in equivalent depositional environments (Basilici, 1997). Figure 5. (A) Histogram of sandstone band thickness measured by digital caliper. 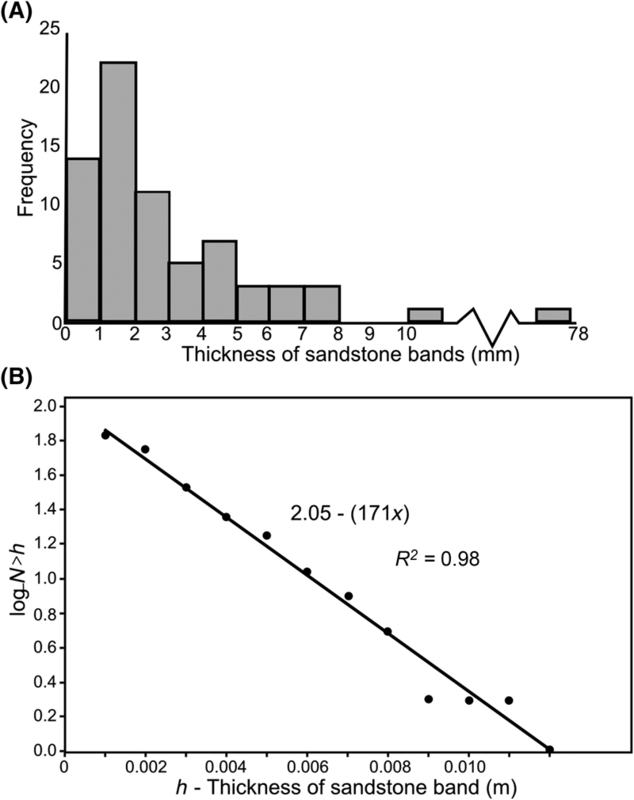 (B) Cumulative frequency of sandstone bands of greater than thickness h (N > h). Best-fit line has coefficient of determination (R2) = 0.98. Thin sandstone sheets and isolated lenticular lobes are typical of outer fan areas of muddy submarine deposition systems (Basilici, 1997). In other studies, similar looking structures have been classified as thin-bedded sand–mud couplets, which are classified as C2.3 in the deep-water facies classification of Pickering et al. (1986). Some of the sandstone bands are continuous and can be traced along strike for tens of meters (>30 ft), whereas others occur as horizons of individual, distinct lenses, which are likely caused by current ripples (Pickering et al., 1986). For the purposes of this study, the bands are classified as high connectivity (continuous for >1 m [>3 ft]), medium connectivity (continuous between 10 cm and 1 m [4 and 39 in. ]), and low connectivity (continuous for <10 cm [<4 in.]). Although it should be noted that turbidites have been reported to have consistent connectivity for many miles (Plink-Björklund and Steel, 2004), that is significantly beyond the scale of this current study. Figure 6 shows how bands of these different connectivities tend to manifest in the field: even the low and medium connectivity bands can be laterally extensive and traceable for many tens of meters (>30 ft) despite the apparent internally unconnected nature of the lenses. Although the poor connectivity could be an artifact of the two-dimensional (2-D) slice presented by the outcrop (i.e., the isolated lenses of low-connectivity sandstone bands are a part of a connected unit in three dimensions), information presented later (Figure 12) shows that the classification is a key determinant of the fluid-flow behavior of the sandstone bands. Rarely, sandstone injectites sourced from the sandstone bands cut through the shale perpendicular to bedding. These injectites are thin (<2 cm [<0.8 in. ]), they typically do not repeat within 50 m (160 ft) along strike of the bedding, and are only represented on the field study area in one location next to the main fault. The rotation of the beds to their current near-vertical dip was likely caused by folding accommodating northwestern–southeastern compression during the Caledonian orogeny. The subsequent formation of the Whitehouse Shore thrust fault and several smaller synthetic thrusts is evidence of ongoing northwestern–southeastern compression (Ingham, 1978). These faults strike subparallel to bedding and are exposed as bed-parallel gullies containing a thin (<2 cm [<0.8 in.]) brecciated zone, which can be traced for tens of meters (>30 ft) across the exposure. Figure 6. Schematic of the different levels of connectivity displayed by the sandstone bands. High-connectivity bands are continuous for more than 1 m (>39 in. ), medium connectivity bands have between segments 10 cm and 1 m (3 and 39 in.) long, and low-connectivity bands are continuous. Conjugate dextral and sinistral strike-slip faults offset the beds and thrust faults. These have been interpreted as the final brittle deformation of the Caledonian orogeny in the late Silurian (Ingham, 1978). The horizontal component of displacement on these strike-slip faults defined by offset of the subvertical bedding in the field site is usually less than 10 m (<30 ft). This is a minimum value because the lack of slickenlines means that dip-slip displacement could not be determined. The fault with the largest apparent displacement (labeled “Main fault gully” in Figure 2) was covered by coastal debris. A section of this fault exposed by seven volunteers with spades digging through coastal debris for a 4-hr tidal window, presented a fault core approximately 20 cm (∼9 in.) wide with loose, uncemented brecciated shale from which individual pieces could be removed by hand. A splay fault off the main fault shows a breccia ranging from 1 to 5 cm (0.4 to 2 in.) wide bounded by slip surfaces. Both slip surfaces have sharp boundaries between the surrounding undeformed rock and the brecciated fault core. Sandstone bands are rotated clockwise into the fault, with some of this strain accommodated by shear fractures. Shear fractures across the field site are oriented synthetic to the larger faults (Figure 3C) and have horizontal offsets from several centimeters to a couple of millimeters (i.e., <1 in. [<2.54 cm]). The shear fractures are primarily oriented west–northwest-east–southeast, synthetic to the main fault, with less-common sets oriented northwest–southeast and north–northwest-south–southeast. Joints (fractures with no visible offset) are preferentially oriented to strike northwest–southeast (perpendicular to bedding) with some spread out to west–northwest-east–southeast and north–northwest-south–southeast (Figure 3D). At the Whitehouse Shore, there is clear evidence for two fluid-flow episodes within the fractures and sandstone bands of the Myoch Formation red shale. The earliest fluid-flow episode caused a phase of calcite cementation. The second fluid-flow episode caused diagenesis of the red shale into green halos around fractures and sandstone bands. Calcite cementation within this outcrop of the Myoch Formation occurs in two forms: (1) as veins within fractures and (2) as pore-filling cement within sandstone bands (Figure 7). Calcite veins can be up to 2 cm (0.8 in.) thick (Figure 7A) but are predominantly 1–3 mm (0.39–0.118 in.) thick (Figure 7C). The calcite fills a subset of fractures; other adjacent fractures and fractures of similar orientations may contain no cement. In the thicker veins, multiple stages of cementation are visible. Calcite was identified within the sandstone bands by the reaction with hydrochloric acid (HCl), whereas the shale beds do not react. Figure 7. Examples of evidence for fluid flow are in the right-hand digitizations: yellow represents sandstone bands, green represents the green halos, and fuchsia represents the calcite veins. (A) One of the thicker carbonate veins containing multiple stages of carbonate deposition. Green halos can be observed at the lower side of the carbonate vein and on both sides of the unfilled fracture intersecting the vein. The palest white is caused by salt efflorescence and is not related to tectonic veining. (B) Network of joints with surrounding green halo intersecting an example of a low-connectivity sandstone band also surrounded by a green halo. (C) Thin carbonate vein with a surrounding green halo runs down the center of the photograph. Vein sinistrally offsets the low-connectivity sandstone band with a surrounding green halo. Ruler scales are in centimeters. Green halos surround a subset of the fractures and sandstone bands (Figure 7). The halos typically extend less than 1 cm (<0.39 in.) from fractures or bands and show a sharp contrast with the surrounding red shale. Green alteration in shale has previously been demonstrated to be caused by the reduction of Fe3+ to Fe2+ (Mykura and Hampton, 1984) along with transportation by diffusion of several minerals (Borradaile et al., 1991). The red shale was likely deposited in oxidizing conditions, with the overlying and underlying green shale layers being indicative of earlier- and later-reducing depositional conditions, respectively. It is therefore likely that postdepositional fluid movement in the subsurface acted to reduce mineral oxides in the red shale. Regardless of the origin of the halos, this chemical alteration can be used to identify individual fractures that have acted as conduits for fluid flow (cf. Eichhubl et al., 2009). Because of sampling restrictions, we were unable to sample the sandstone bands to determine which specific bands or parts of individual bands hosted calcite cement. However, where checked, these bands always reacted with HCl, indicating the presence of calcite. Therefore, we have taken that those bands, which were part of the second fluid-flow episode creating the green halos, also hosted the earlier calcite-precipitating flow episode. There is clear field evidence that calcite veins and cements preceded the formation of the green halos. Crosscutting relationships showing green halo fractures terminating against calcite-filled fractures (Figure 8A) are repeated throughout the field site, whereas the converse was never observed. Additionally, in places, the margin of calcite veins has acted as a focus for subsequent fracturing. Where this has occurred, green halos are confined to only one side of the fracture (Figure 8B). The calcite vein has acted as a barrier, stopping the fluid reacting with the opposite fracture wall. Figure 8. (A) Carbonate vein with shear movement. Joint with the green halo terminates against a preexisting carbonate vein. (B) The green halo is confined to one side of the fracture implying the carbonate in the vein acted as a barrier to chemical alteration on the other side. Where the green halo switches side, there is a jog in the fracture and cracks in the carbonate, so the reducing fluid may have transferred which side of the vein it was on at this point. In this and subsequent figures, schematics are used to illustrate the geometrical relationships because the details do not show up particularly clearly in photographs. Figure 9 shows a map of the fractures and sandstone bands as identified in the field. The map was established by defining a 1-m2 (3-ft2) string grid over the field site. Each square meter was photographed, and interpretations were annotated directly onto the photographs in the field during several low-tide “windows.” These were then digitized and stitched together to make an initial map. The map was then ground truthed during subsequent low tides to ensure that stitching the images had preserved the geometry and to ensure that fine details were included with particular attention to the connections between the features. All fractures displayed calcite fill, green halos, or both. Large sandstone bands all displayed green halos and small unconnected bands, that were too small to be included in the map, sometimes had no halo. Figure 4. Sedimentary transect showing location and thickness of sandstone bands, including those with a surrounding green halo. Figure 9. Distribution of fractures, sandstone bands, and thrust faults color coded by diagenetic evidence for fluid flow. Areas unobservable because they are covered by coastline debris are shown in blue and labeled as “covered area.” The thick dotted gray lines and text indicate how the field is split into the southern, central, and northern areas in subsequent figures. The fracture density (defined as fracture midpoints per square meter) of calcite-filled and green halo fractures was counted using 46 circular scan lines, with diameters of 0.6–1.2 m (2–4 ft) (Mauldon et al., 2001). Scan line diameter was selected to be larger than the blocks between fractures to ensure an adequate rate of sampling (Rohrbaugh et al., 2002), and because of unpredictable tidal debris cover, locations were selected to ensure adequate exposure within the scan line area. Shear fractures have orientations synthetic or antithetic to the main faults, and joints generally bisect the conjugate shear fractures (Figure 3). The calcite veins were often observed to be within the long, conjugate shear fractures. Conversely, green halos are more common around shorter northwest–southeast-trending fractures, which tend to have no observable shear offset. The field observations indicate that areas bounded by the main fault and splay fault have differing fracture properties. To aid discussion, the field area has been split up into the “southern area” between the southwest boundary and the main fault gully, “central area” between the main fault gully and the splay fault, and “northern area” between the splay fault and the northeast boundary labeled on Figure 10 as the second fault gully. Both the calcite veins and green halo fractures are highest density in the central area between the main fault and the splay fault (Figure 10). The two particularly high-density values for calcite veins (labeled as “a” and “b” on Figure 10) were caused by ladder geometry fractures between the splay fault and close proximity synthetic shear fractures. The calcite veins also show relatively high density in the northern area, whereas the green halos do not; this distribution can clearly be seen in the detailed fracture map of Figure 9 in which very few green halos are located in the northern area. Figure 10. Fracture density across field site for carbonate veins (filled markers) and fractures with surrounding green halo (empty markers). Gray vertical bars show locations of faults relative to where circular scan line data were collected. Locations of vertical bars correspond with the labeled faults and split the data into the southern, central, and northern areas as shown on Figure 9. Each datum shows the value recorded from one circular scan line. The median values for carbonate fracture 8 density are 0.0, 14.1, and 11.8 for the southern, central, and northern area, respectively; the median values for green halo fractures are 0.2, 7.1, and 0.0. Labels a and b are zones of particular high density. Orientation data were collected from 146 fractures within the detailed mapped area shown on Figure 9. Figure 11 shows the orientations of the fractures divided into opening and shear mode (Figure 11B, C) and also by type of fluid alteration (Figure 11D–F). Figure 11. Orientations of different features. (A) Orientation data taken for four of the sandstone bands. (B, C) Fracture data split into shear fractures and joint. (D, E) Fracture orientation data grouped by the type of evidence for fluid flow. The orientations shown in (F) “carbonate and green” are a combined subset from both (D) “green halo fractures” and (E) “carbonate-filled fractures” and contain the fractures that appear in both fluid-flow episodes. Stereonets were created using “Stereonet 9” (Allmendinger et al., 2011; Cardozo and Allmendinger, 2013). Labels B1 and B2 highlight clustering of shear fractures N-S and W-E respectively. C1 and C4 show clustering of joints striking W-E, C2 and C5 joints clustering NW-SE, and C3 shows joints clustering at NNW-SSW. D2 and D4 show green halo fractures clustered at strikes of NW-SE with a smaller group of green halo fractures clustered at strikes of E-W shown by D1 and D3. E2 and E4 highlight calcite filled fractures clustered at strikes of NW-SE, whereas E1 and E3 highlight calcite filled fractures clustered around E-W strikes. F1 and F3 highlight fractures which hosted both fluid-flow events clustered around E-W strikes and F2 and F3 highlighting those clustered round N-S strikes. The sandstone bands are consistently steeply dipping (almost vertical) and strike southwest–northeast (Figure 11A). All fracture classifications (opening and shear mode as well as both fluid-flow alteration types) have strikes within 45° of northwest–southeast. However, the orientations are not spread evenly within this area as some of the fracture types show particular clusters, highlighted on Figure 11 (e.g., Figure 11C1–C5). Joints and shear fractures have slightly different orientation distributions. The joint orientations are clustered around west–east (Figure 11C1, C2), northwest–southeast (Figure 11C2, C5), and also north–northeast-south–southwest strikes (Figure 11C3). The shear fractures have much fewer orientation data than the joints; however, the shear fractures appear to show a cluster striking north–south and also west–east (Figure 11B1, B2, respectively). Although there are also some shear fractures striking northwest–southeast, there are proportionally less in this orientation than the joints. The green halo fractures also show differences in orientation distribution to those fractures with calcite fill. A high proportion of the green halo fractures are clustered around northwest–southeast strikes (Figure 11D2, D4), and a smaller proportion are clustered around east–west strikes (Figure 11D1, D3). Although the calcite-filled fractures also have a small cluster around northwest–southeast strikes (Figure 11E2, E4), there is a greater proportion clustered around east–west strikes (Figure 11E1, E3). Additionally, the calcite-filled fractures also show a small cluster around a strike of north–south. The fractures, which hosted both fluid-flow events, cluster around east–west strikes (Figure 11F1, F3) and northwest–southeast strikes (Figure 11F2, F4), with a smaller proportion striking north–south. Field evidence for fluid flow demonstrates that the architecture and the length of each sandstone band control its connectivity to the wider fluid-flow network. The internal connectivity of the sandstone bands (Figure 6) strongly correlates with the likelihood of a sandstone band having hosted fluid flow; high-connectivity sandstone bands are far more likely to be surrounded by green halos than the low-connectivity sandstone bands (Figure 12). Of the 6 high-connectivity sandstone bands, 5 (83%) hosted fluid flow compared with only 9 of the 27 (33%) low-connectivity sandstone bands. The lateral extent of the sandstone bands (see Figure 12 for definition) is also a factor, with the longer bands being more likely to host fluid flow. Of the 33 high-extent sandstone bands, 14 (42%) hosted fluid flow compared with only 1 of the 5 (20%) low-extent bands (Figure 12). Although there is not as strong a relationship between the extent of the sandstone bands and their likelihood to have hosted diagenetic fluid flow as with connectivity, the observations are consistent with longer sandstone bands being more likely to intersect with other features that are open to fluid flow. Figure 12. 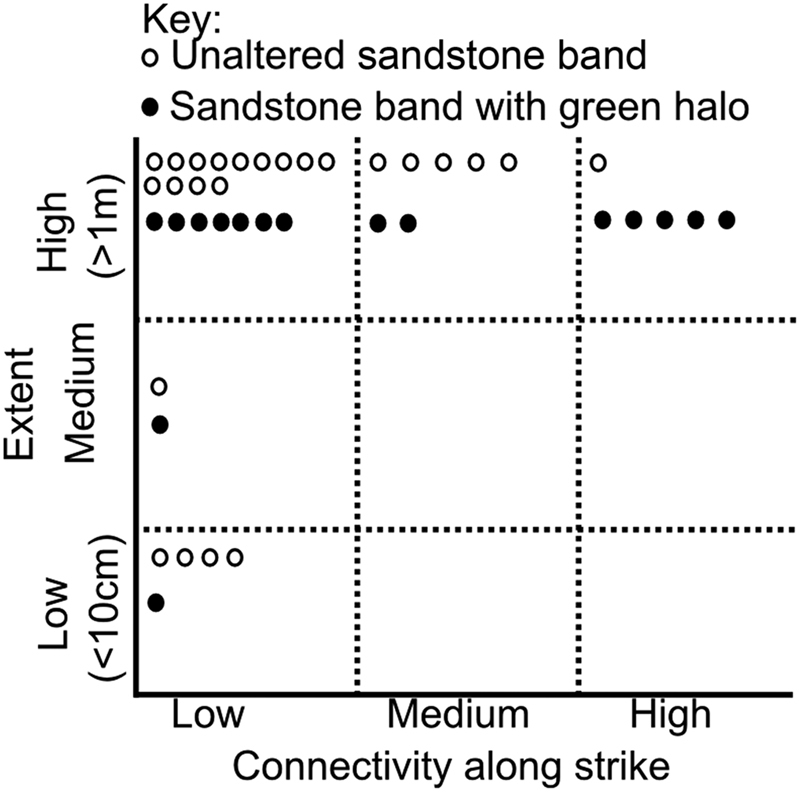 Comparison of the influence of connectivity (defined in Figure 6) and extent of the likelihood of a sandstone band having a green halo. Lateral extent measures how far across the outcrop a sandstone band could be traced (even if that band was of low connectivity and made of isolated lenses). Each dot shows a sandstone band classified by its observed connectivity and extent with the presence or absence of green halo. For example, out of five sandstone bands with both low connectivity and low extent, only one has a green halo, whereas five out of six do for sandstone bands with both high connectivity and high extent. The sandstone bands are separated by irregular thicknesses of shale. If we assume that shale deposition is relatively constant, then the spacings between the sandstone bands may provide information about the timing of events that caused the turbidite flows depositing the coarser-grained material. The spacing of the sandstone bands were measured to the nearest half-centimeter using survey tape laid perpendicular to the bedding. The majority of the sandstone bands are spaced at intervals smaller than 0.1 m (0.33 ft) (Figure 13A), although two intervals are much wider than the others at 0.66 and 0.81 m (2.2 and 2.7 ft), respectively. A negative exponential trend could be fit to the spacing distributions (Figure 13B), although the two widest spacings were not used in this fit resulting from not being sufficiently sampled to show a trend at these wider spacings. Figure 13. 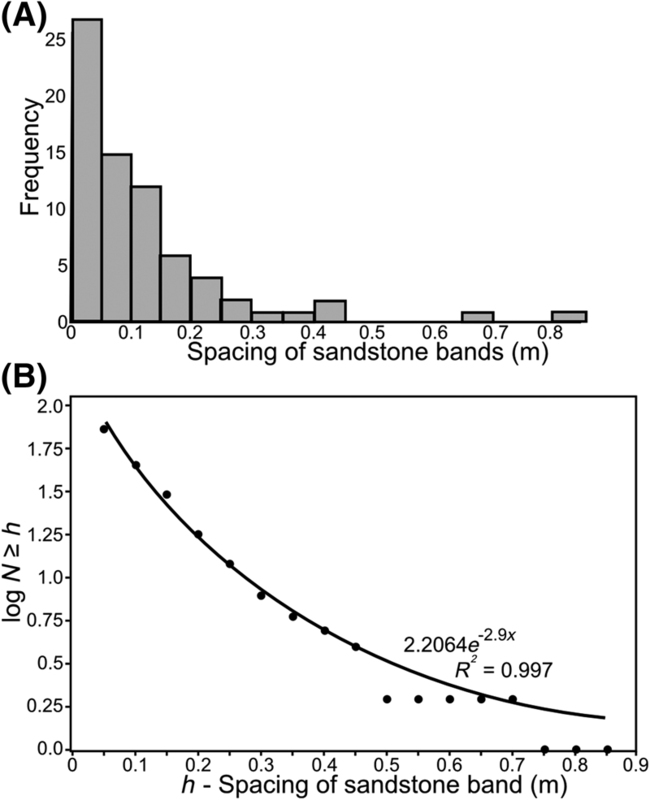 (A) Histogram of spacing of the sandstone bands. (B) Cumulative frequency of spacing of sandstone bands where N ≥ h denotes number of spacings greater than or equal to a spacing magnitude (h). An exponential is fitted to the data of 0.45 m (1.5 ft) and under, because above this value, the sandstone bands are not sufficiently sampled; the best-fit line shows a coefficient of determination (R2) = 0.997 and formula of y = 2.2064e−2.9x, for the data of 0.45 m (1.5 ft) and under. Both calcite and green halos are restricted to within or very close to the highest permeability features in the rock, demonstrating that the fluids that caused these diagenetic effects were confined to networks comprising fractures, thrust faults, strike-slip faults, and sandstone bands. The map in Figure 9 was used to explore the network connectivity of these features and the differences between the two recorded fluid-flow episodes. Connectivity was defined by counting how many connections each mapped fracture had with the other fractures, thrusts, and sandstone bands. The true three-dimensional (3-D) network may have more connectivity than the exposed 2-D network, which was used to collect the connectivity data (Odling et al., 1999). However, the 2-D network is the only viable way to collect field data on the connectivity between the features. Figure 14 shows fracture connectivity for the three areas of the map (the southern, central, and northern areas). When the fracture network is considered in isolation (i.e., not considering the sandstone bands or thrust faults), the majority of fractures have one or zero connections (Figure 14A–C). For fluid flow to travel through such a potential fluid pathway, there must be at least two connections so as not to make a “dead end.” The first thing to note is that the fracture connectivity is lowest in the southern area, highest in the central area, and the northern area connectivity is approximately midway between the other two areas. This pattern of fracture connectivity correlates with the fracture density (Figure 10). 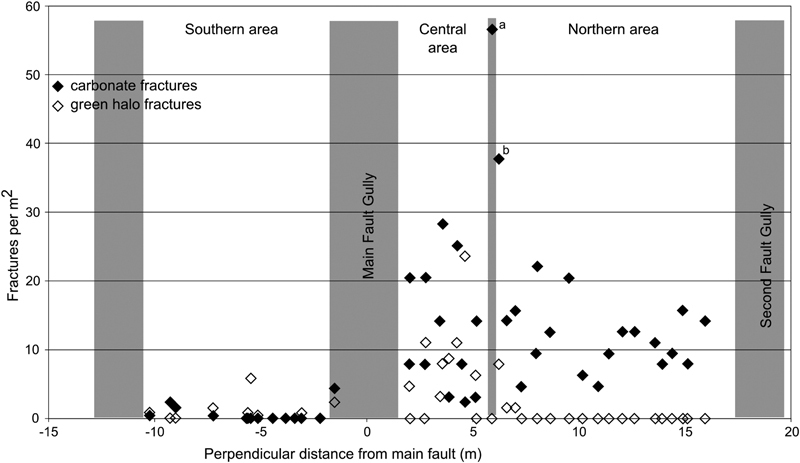 The higher fracture density of the central and northern areas means that a higher proportion of fractures has two or more connections, compared with the southern area. However, the central and northern areas still have a median connectivity of one, indicating that at least half of the fractures are still visible as dead ends in the exposed 2-D fracture network. 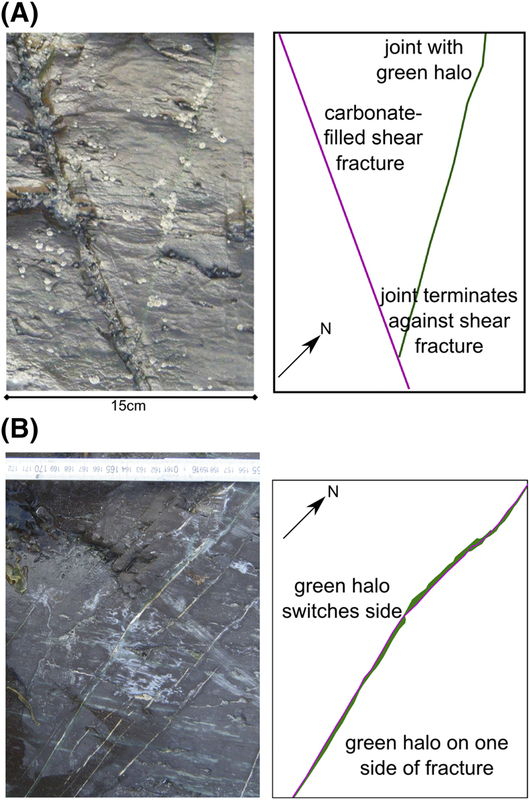 Such low values of individual fracture connectivity might usually be indicative of fracture network with low hydraulic connectivity; however, the calcite and green halos show that these fractures have been used as part of fluid-flow episodes in the past. Figure 14. Histograms showing the frequency of fracture connectivity. The x-axis shows how many times each fracture intersects with another fracture. The data have been split between the three field areas shown in Figure 8. (A) South area; fractures only. (B) Central area; fractures only. (C) North area; fractures only. If there had not been any diagenesis to provide evidence that the sandstone bands were used during flow episodes, then it would have been standard practice to examine the fracture network connectivity alone. In Figure 15, the connectivity of the combined flow network is calculated by including the sandstone bands and thrusts when counting the connections of each fracture. This means that some fractures, which may have previously been considered isolated or dead ends, are now connected to the flow network by intersections with sandstone bands. The full fluid-flow network (fractures and bands) for the earlier calcite-precipitating fluid-flow episode (Figure 14) has higher connectivity than when considering the fracture network alone. This enhanced connectivity is shown by the lower proportion of fractures with zero or one connection. A similar pattern is seen for the fractures and bands in the later green halo fluid-flow episode (Figure 14B). This indicates that the sandstone bands are connecting otherwise isolated fractures. The full network has a median number of connections per fracture of 5 cm (2 in.) each area (Figure 15) compared to the fractures alone (Figure 15). It is also worth noting that even in the southern area, where fracture density is low, the influence of the sandstone bands is enough to triple the upper quartile number of connections per fracture. How Has the Network Connectivity Influenced Fluid Flow through the Shale Over Time? The bulk permeability properties of the shale will have been strongly influenced by the connectivity of the permeable features during the geological history of the shale. An increase in average fracture connectivity, caused by fracture initiation or propagation, would increase the likelihood of complete fracture pathways forming, which transverse the shale layer. Conversely, should a key network connection close, the unit could return to more sealing behavior. In the field example presented in this paper, the main fault could be considered such a key connection. If the main fault were closed to fluid flow (for instance by diagenesis), but other pathways remained open, the shale would not become a seal despite a likely significant drop in overall bulk permeability. Examining the differences between the two fluid-flow networks captured in this outcrop provides valuable insights into the hydraulic history of this shale. Figure 15. 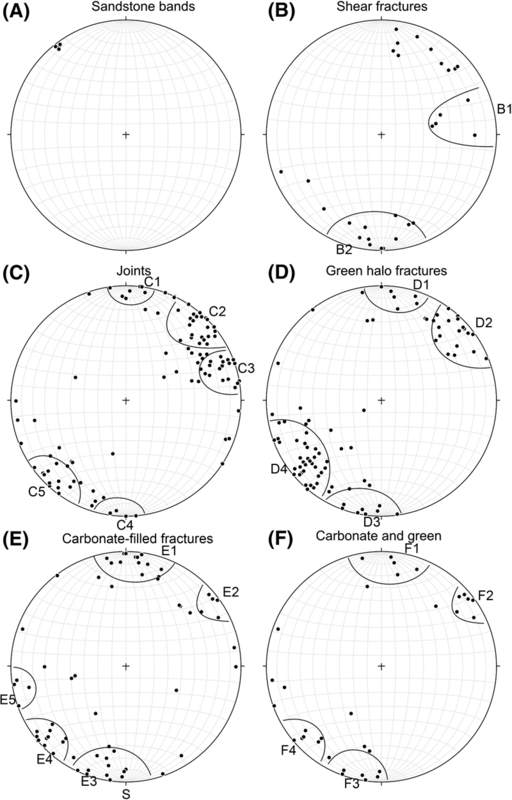 Histograms of connectivity of (A) carbonate-filled fractures and (B) green halo fractures. Connectivity in this case includes when the fracture connects with all other features of that fluid-flow episode, that is, including connections with sandstone bands and thrust faults. Initially after deposition and burial, the shale formation would have had very low porosity (Aplin and Macquaker, 2011) and therefore low permeability (Yang and Aplin, 2007; Armitage et al., 2011). Before any fracturing of the rock, there would have been no hydraulic connectivity between the sandstone bands except for via the rare sandstone injectites. The first deformation features are the folding and bedding-parallel thrust faults. The folding resulted in the exposed Whitehouse Formation having subvertical dip. No fold-related fracturing was recorded by Ingham (1978) or by this study, so new connections between sandstone bands may not have formed at this stage. 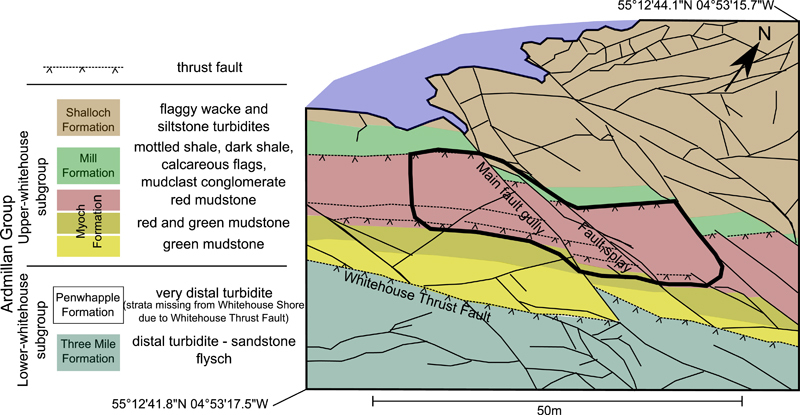 The thrust faults are related to the Whitehouse Shore thrust fault, which dips to the northwest (Figure 2). During this tectonic event, the thrust faults may have become critically stressed (Barton et al., 1995) and could have provided potential fluid-flow pathways between any sandstone band that was intersected and offset. The next stage of deformation was the formation of the subseismic scale strike-slip faults (Ingham, 1978). These faults and related fractures are well oriented to intersect with many of the sandstone bands. These intersections, and the fact that the fractures tend to be relatively large features cutting through much of the shale, formed a well-connected network. This network was then exploited during the first fluid episode, which left evidence of calcite precipitation. However, this calcite precipitation, or other possible effects such as stress changes, subsequently acted to close many of these larger faults and fractures such that for the second fluid-flow episode, which created the green halos, there were fewer large features contributing to the fluid-flow network. This effect is particularly strong in the northern area of the field site, in which the density of fractures contributing to the fluid-flow network decreases dramatically between the two fluid-flow episodes (Figure 10), although some fractures did remain open during both fluid-flow episodes (Figure 15B). Conversely, the central area maintained high fracture density between the fluid-flow episodes; this may be because of the closely spaced main fault and splay fault (Figure 9). Such fault interaction areas have previously been recorded as having enhanced fluid-flow rates caused by high fracture density (Curewitz and Karson, 1997; Gartrell et al., 2004; Ligtenberg, 2005), including in some shale gas reservoirs (Gale et al., 2007). The significant drop in the number of conductive fractures of the northern area in the time between the two fluid-flow episodes would normally be expected to cause a decrease in connectivity (Berkowitz, 1995; Harris et al., 2003), particularly when compared to the central area, which did not experience a significant drop in fracture density. 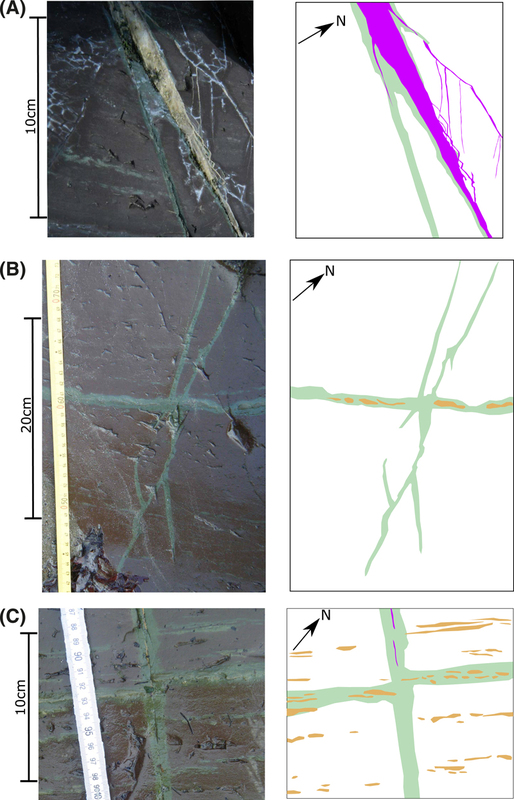 However, despite the closure of the longer fractures after the first calcite-precipitating flow episode, flow network connectivity was maintained because of the influence of the sandstone bands (Figure 15) and the propagation of new fractures (Figure 11E). Nevertheless, the flow network through the shale would now be more tortuous because of the interconnectivity required between the fractures and sandstone bands. Because the bands are perpendicular to the fractures, the result is a very well-connected network for flow, and this unit did not behave as a seal. However, if only fractures had been considered, the density of open fractures would not have been enough to form connected networks through the shale, and the unit would have been wrongly classified as sealing. These high-permeability sandstones are small-scale versions of the thief zones within seals or high-permeability streaks observed in reservoir rocks (Felsenthal and Gangle, 1975). Prediction of risks and opportunities remains the goal of much applied geoscience during hydrocarbon or geothermal exploration. The statistically constrained relationships (Figures 5, 10, 13) of the fluid-flow features indicate that such combined sedimentary-structural networks could be predictable. Naturally, during any exploration, a well-exposed outcrop will not be present, so it is important to ask how many of these features would have been picked up in wire-line logs. From discussion with industry, the limit of high-resolution wire-line logging is 5 mm(0.19 in.). Most of the sandstone bands are below this thickness and would therefore not be detected in an exploration setting; 82% of the sandstone bands with green halos had thicknesses less than 5 mm (<0.19 in. ), whereas 78% of the bands with no halo (i.e., not connected to the network) had thicknesses less than 5 mm. There are no significant differences between the ratio of number bands with green halos and those without, greater than or less than this 5-mm (0.19-in.) threshold, indicating that thickness is not a key factor for fluid flow. Given that sandstone bands are a key factor within the flow network, it would be desirable to be able to predict the thickness and spatial distribution of the bands with the greatest lateral extent, because these may be below detection threshold. Figure 5 showed that there is a relationship between the thicker and thinner bands in this study, but does this relationship hold for much thicker bands (e.g., >10 cm [>4 in.])? Studies of thicker turbidites (>10-cm [>4-in.] thickness) in submarine fan depositional systems report thickness-frequency distributions that are exponential (Sinclair and Cowie, 2003), log-normal (Talling, 2001), or power law (Hiscott et al., 1992) and that these distributions may be site specific. A complicated range of factors affect thickness distributions, such as the location within depositional setting and magnitude of triggering event (Carlson and Grotzinger, 2002). The variations in thickness distribution have also been attributed to channelized versus nonchannelized material flows resulting from depositional topography (Carlson and Grotzinger, 2001) and to buoyancy changes as the turbidity current “thins” during transport and deposition (Pritchard and Gladstone, 2009). Log-normal distributions have been attributed to undersampling of thin beds, although Talling (2001) disputed whether this is caused by undersampling or a true reflection of material deposition. fdfbbacbfqfcwssfxytxvdxweeaywsve Figure 16. Cumulative frequency–thickness plot of turbidite thicknesses of the Annot Sandstone (data from Sinclair and Cowie, 2003). A regression line with a slope (m) of 0.33 fits the data; for the smallest turbidites, the slope of the regression line steepens to 1.3. 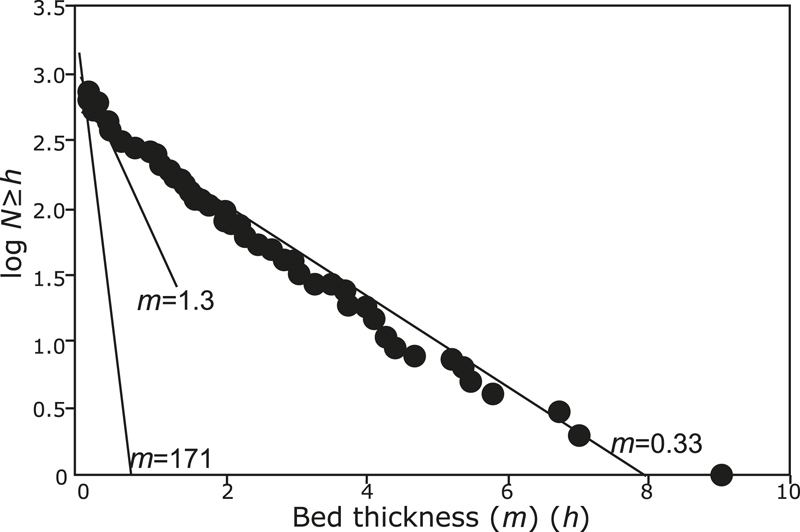 The 171 sloping line is an approximation of the fit to the data presented from Figure 5. h = bed thickness; N = number of beds. The data presented in this study, in combination with those of Sinclair and Cowie (2003), suggest that the distribution of turbidite thickness within an individual turbidite sequence is well modeled by an exponential distribution (Figure 16). However, the parameter values that govern the exponential distribution vary. This is to be expected; for example, the statistics of turbidites triggered by floods are likely to vary between locations with differing climates, whereas the statistics of turbidites triggered by earthquakes will vary based on the earthquake magnitude–frequency distribution of proximal faults. Further, at a given site, turbidite thickness will decrease with increasing distance from the turbidite source (i.e., toward the edge of the fan). Although a relatively small number of studies have been conducted on the thickness of proximal and distal turbidites, even fewer have been published on turbidite thickness as a function of their lateral extent. To predict sandstone band thickness and spacing distributions in a turbidite sequence, not only should more data be collected from multiple outcrops (ideally including exposures both parallel and perpendicular to bedding), but these data should be pooled to develop generalizable statistical models based on turbidite triggering mechanism and location within the turbidite fan. A typical solution to further investigate such a sedimentary-structural flow network would be discrete fracture network (DFN) modeling. It is beyond the scope of this current paper to produce a DFN model, but the observations and data can inform how a DFN model could be constructed. This field study effectively presents a 2-D window into the natural complicated 3-D system, which would be modeled in a DFN. The observations made from the 2-D outcrop, such as the central zone of high fracture connectivity surrounded by closely spaced faults, would be used to directly inform a modeled 3-D network. The sandstone bands would be added into the DFN as a “fracture set.” The setup of this hypothetical DFN requires statistics that characterize the “real” fracture and joint sets as well as an extra set that represents the sandstone band statistics. Data on such sandstone bands could be determined from image logs. Thinner band distribution is related to the seismic-scale beds (statistics as discussed in this paper) but attention is paid to the source mechanism and basin topography (Sinclair and Cowie, 2003), turbidite sources, such as fault movement (e.g., Goldfinger et al., 2007), or storm events (e.g., Gorsline et al., 2000; Malamud and Turcotte, 2006). The joint frequency could be inferred from shale bed thickness and fracture frequencies, location, and orientation of seismic-scale faults (e.g., Bonnet et al., 2001; Manzocchi et al., 2009). These sedimentary and structural statistical distributions would then provide a basis to statistically populate a DFN-style model, used to characterize bulk permeability properties of the unit. The field observations in this paper are a vital scale bridge between core data (which does not give bulk rock properties) and seismic data (which cannot detect small but important network features) to inform how features in such networks interact to create fluid-flow systems. Mineral precipitation and diagenetic alteration have allowed tracing of pathways of paleo–fluid-flow episodes in the Myoch Formation at Girvan, Scotland. Such fluid flow is expected to be confined to the fracture networks within such low-permeability rock. This study demonstrates that very thin (<1 cm [<0.39 in.]) and relatively poorly connected sandstone layers can act to enhance the fracture connectivity. If these sandstone bands link otherwise isolated fractures, the bands would have been a crucial factor in creating a connected network for fluid flow through the shale. The otherwise poorly connected fractures would not have been able to host such fluid flow without these sandstone bands. It is possible that such sedimentary structures in shales may be one route to forming sweet spots in shale gas reservoirs. Sampling of such thin sandstone bands is confounded by their low thickness (below the resolution of wire-line logging tools) and poor outcrop exposure; there is also a relative paucity of data on such thin layers. However, the thin sandstone bands, which are below the thickness of resolution, show statistical distributions related to the thicker (>5 mm [>0.19 in.]) detectable bands in this study. Although such fine-scale combined structural-sedimentary flow networks may seem too complex to realistically develop useful prediction methods, the observations in this paper suggest that each of the important statistical properties of such fluid-flow networks could be constrained, improving prediction of seal and fluid-flow behavior in similar settings. Allmendinger, R. W., N. Cardozo, and D. M. Fisher, eds., 2011, Structural geology algorithms: vectors and tensors: Cambridge, United Kingdom, Cambridge University Press, 289 p, doi:10.1017/CBO9780511920202. Aplin, A. C., A. J. Fleet, and J. H. S. Macquaker, eds., 1999, Muds and mudstones: Physical and fluid-flow properties: Geological Society London, Special Publications 1999, v. 158, no. 1, p. 1–8, doi:10.1144/GSL.SP.1999.158.01.01. Aplin, A. C., and J. H. S. Macquaker, 2011, Mudstone diversity: Origin and implications for source, seal, and reservoir properties in petroleum systems: AAPG Bulletin, v. 95, no. 12, p. 2031–2059, doi:10.1306/03281110162. Armitage, P. J., D. R. Faulkner, R. H. Worden, A. C. Aplin, A. R. Butcher, and J. Iliffe, 2011, Experimental measurement of, and controls on, permeability and permeability anisotropy of caprocks from the CO2 storage project at the Krechba Field, Algeria: Journal of Geophysical Research: Solid Earth, v. 116, p. 1978–2012, doi:10.1029/2011jb008385. Barton, C. A., M. D. Zoback, and D. Moos, 1995, Fluid flow along potentially active faults in crystalline rock. : Geology, v. 23, no. 8, p. 683–686, doi:10.1130/0091-7613(1995)023<0683:FFAPAF>2.3.CO;2. Basilici, G., 1997, Sedimentary facies in an extensional and deep-lacustrine depositional system: The Pliocene Tiberino Basin, Central Italy: Sedimentary Geology, v. 109, no. 1–2, p. 73–94, doi:10.1016/S0037-0738(96)00056-5. Berkowitz, B., 1995, Analysis of fracture network connectivity using percolation theory: Mathematical Geology, v. 27, no. 4, p. 467–483, doi:10.1007/BF02084422. Bolton, A. J., A. J. Maltman, and Q. Fisher, 2000, Anisotropic permeability and bimodal pore-size distributions of fine-grained marine sediments: Marine and Petroleum Geology, v. 17, no. 6, p. 657–672, doi:10.1016/S0264-8172(00)00019-2. Bonnet, E., O. Bour, N. E. Odling, P. Davy, I. Main, P. Cowie, and B. Berkowitz, 2001, Scaling of fracture systems in geological media: Reviews of Geophysics, v. 39, no. 3, p. 347–383, doi:10.1029/1999RG000074. Borradaile, G. J., A. MacKenzie, and E. Jensen, 1991, A study of colour changes in purple-green slate by petrological and rock-magnetic methods: Tectonophysics, v. 200, p. 157–172, doi: 10.1016/0040-1951(91)90012-h.
Bouma, A. H., P. H. Kuenen, and F. P. Shepard, 1962, Sedimentology of some flysch deposits: A graphic approach to facies interpretation: Amsterdam, Elsevier, 168 p.
Burnside, N. M., Z. K. Shipton, B. Dockrill, and R. M. Ellam, 2013, Man-made versus natural CO2 leakage: A 400 k.y. history of an analogue for engineered geological storage of CO2: Geology, v. 41, no. 4, p. 471–474, doi:10.1130/G33738.1. Cardozo, N., and R. W. Allmendinger, 2013, Spherical projections with OSXStereonet: Computers & Geosciences, v. 51, p. 193–205, doi:10.1016/j.cageo.2012.07.021. Carlson, J., and J. P. Grotzinger, 2001, Submarine fan environment inferred from turbidite thickness distributions: Sedimentology, v. 48, no. 6, p. 1331–1351, doi:10.1046/j.1365-3091.2001.00426.x. Cartwright, J., M. Huuse, and A. Aplin, 2007, Seal bypass systems: AAPG Bulletin, v. 91, no. 8, p. 1141–1166, doi:10.1306/04090705181. Crimes, T. P., 1973, From limestones to distal turbidites: A facies and trace fossil analysis in the Zumaya flysch (Paleocene—Eocene), North Spain: Sedimentology, v. 20, p. 105–131, doi:10.1111/j.1365-3091.1973.tb01609.x. Curewitz, D., and J. A. Karson, 1997, Structural settings of hydrothermal outflow: Fracture permeability maintained by fault propagation and interaction: Journal of Volcanology and Geothermal Research, v. 79, no. 3–4, p. 149–168, doi:10.1016/S0377-0273(97)00027-9. Davatzes, N. C., and A. Aydin, 2003, Overprinting faulting mechanisms in high porosity sandstones of SE Utah: Journal of Structural Geology, v. 25, no. 11, p. 1795–1813, doi:10.1016/S0191-8141(03)00043-9. Dewhurst, D. N., and A. F. Siggins, 2006, Impact of fabric, microcracks and stress field on shale anisotropy: Geophysical Journal International, v. 165, no. 1, p. 135–148, doi:10.1111/j.1365-246X.2006.02834.x. Dockrill, B., and Z. K. Shipton, 2010, Structural controls on leakage from a natural CO2 geologic storage site: Central Utah, USA: Journal of Structural Geology, v. 32, no. 11, p. 1768–1782, doi:10.1016/j.jsg.2010.01.007. Eichhubl, P., N. C. Davatzes, and S. P. Becker, 2009, Structural and diagenetic control of fluid migration and cementation along the Moab fault, Utah: AAPG Bulletin, v. 93, no. 5, p. 653–681, doi:10.1306/02180908080. Eichhubl, P., P. S. D’Onfro, A. Aydin, J. Waters, and D. K. McCarty, 2005, Structure, petrophysics, and diagenesis of shale entrained along a normal fault at Black Diamond Mines, California—Implications for fault seal: AAPG Bulletin, v. 89, no. 9, p. 1113–1137, doi:10.1306/04220504099. Evans, M. A., 1994, Joints and décollement zones in Middle Devonian shales: Evidence for multiple deformation events in the central Appalachian Plateau: Geological Society of America Bulletin, v. 106, no. 4, p. 447–460, doi:10.1130/0016-7606(1994)106<0447:JADCZI>2.3.CO;2. Fairley, J. P., and J. J. Hinds, 2004, Rapid transport pathways for geothermal fluids in an active Great Basin fault zone: Geology, v. 32, no. 9, p. 825–828, doi:10.1130/G20617.1. Felsenthal, M., and F. J. Gangle, 1975, A case study of thief zones in a California waterflood: Journal of Petroleum Technology, v. 27, no. 11, p. 1385–1391, doi:10.2118/5363-PA.
Gale, J. F. W., S. E. Laubach, J. E. Olson, P. Eichhubl, and A. Fall, 2014, Natural fractures in shale: A review and new observations: AAPG Bulletin, v. 98, no. 11, p. 2165–2216, doi:10.1306/08121413151. Gale, J. F. W., R. M. Reed, and J. Holder, 2007, Natural fractures in the Barnett Shale and their importance for hydraulic fracture treatments: AAPG Bulletin, v. 91, no. 4, p. 603–622, doi:10.1306/11010606061. Gartrell, A., Y. Zhang, M. Lisk, and D. Dewhurst, 2004, Fault intersections as critical hydrocarbon leakage zones: Integrated field study and numerical modelling of an example from the Timor Sea, Australia: Marine and Petroleum Geology, v. 21, no. 9, p. 1165–1179, doi:10.1016/j.marpetgeo.2004.08.001. Gaus, I., 2010, Role and impact of CO2–rock interactions during CO2 storage in sedimentary rocks: International Journal of Greenhouse Gas Control, v. 4, no. 1, p. 73–89, doi:10.1016/j.ijggc.2009.09.015. Glaser, K. S., C. K. Miller, G. M. Johnson, B. Toelle, R. L. Kleinberg, P. Miller, and W. D. Pennington, 2013, Seeking the sweet spot: Reservoir and completion quality in organic shales. : Oilfield Review, v. 25, p. 16–29, doi:10.3997/2214-4609.20143899. Goldfinger, C., A. E. Morey, C. H. Nelson, J. Gutiérrez-Pastor, J. E. Johnson, E. Karabanov, J. Chaytor, and A. Eriksson, ; Shipboard Scientific Party, 2007, Rupture lengths and temporal history of significant earthquakes on the offshore and north coast segments of the Northern San Andreas Fault based on turbidite stratigraphy: Earth and Planetary Science Letters, v. 254, no. 1–2, p. 9–27, doi:10.1016/j.epsl.2006.11.017. Gorsline, D. S., T. De Diego, and E. H. Nava-Sanchez, 2000, Seismically triggered turbidites in small margin basins: Alfonso Basin, western Gulf of California and Santa Monica Basin, California borderland: Sedimentary Geology, v. 135, no. 1–4, p. 21–35, doi:10.1016/S0037-0738(00)00060-9. Haney, M. M., R. Snieder, J. Sheiman, and S. Losh, 2005, A fault caught in the act of burping: Centre for Wave Phenomena Scientific Report., v. 513, p. 219–223. Harris, S. D., E. McAllister, R. J. Knipe, and N. E. Odling, 2003, Predicting the three-dimensional population characteristics of fault zones: A study using stochastic models: Journal of Structural Geology, v. 25, no. 8, p. 1281–1299, doi:10.1016/S0191-8141(02)00158-X. Hiscott, R. N., A. Colella, P. Pezard, M. A. Lovell, and A. Malinverno, 1992, Sedimentology of deep-water volcaniclastics, Oligocene Izu-Bonin forearc basin, based on formation microscanner images. Proceedings of the Ocean Drilling Project, Scientific Results, v. 126, p. 75–96, doi:10.2973/odp.proc.sr.126.118.1992. Hubert, J. F., 1966, Sedimentary history of Upper Ordovician geosynclinal rocks, Girvan, Scotland: Journal of Sedimentary Research, v. 36, p. 677–699, doi:10.1306/74d71541-2b21-11d7-8648000102c1865d. Ince, D., 1984, Sedimentation and tectonism in the Middle Ordovician of the Girvan district, SW Scotland: Transactions of the Royal Society of Edinburgh: Earth Sciences, v. 75, no. 2, p. 225–237, doi:10.1017/S0263593300013869. Ingham, J. K., 1978, Geology of a continental margin 2: Middle and Late Ordovician transgression, Girvan, in D. R. Bowes and B. E. Leake, eds., Crustal evolution in northwestern Britain and adjacent regions, Geological Journal Special Issue 10, p. 163–167. Kampman, N., N. M. Burnside, Z. K. Shipton, H. J. Chapman, J. A. Nicholl, R. M. Ellam, and M. J. Bickle, 2012, Pulses of carbon dioxide emissions from intracrustal faults following climatic warming: Nature Geoscience, v. 5, no. 5, p. 352–358, doi:10.1038/ngeo1451. Kim, J.-S., S.-K. Kwon, M. Sanchez, and G.-C. Cho, 2011, Geological storage of high level nuclear waste. : Korean Society of Civil Engineers Journal of Civil Engineering, v. 15, no. 4, p. 721–737, doi:10.1007/s12205-011-0012-8. Lash, G. G., and T. Engelder, 2009, Tracking the burial and tectonic history of Devonian shale of the Appalachian Basin by analysis of joint intersection style: Geological Society of America Bulletin, v. 121, p. 265–277, doi:10.1130/b26287.1. Lawson, J. D., and D. S. Weedon, eds., 1992, Geological excursions around Glasgow and Girvan: Glasgow, United Kingdom, Geological Society of Glasgow, 432 p.
Lehner, F. K., and W. F. Pilaar, 1997, The emplacement of clay smears in synsedimentary normal faults: Inferences from field observations near Frechen, Germany: Oslo, Norway, Norwegian Petroleum Society Special Publications 7, p. 39–50, doi:10.1016/S0928-8937(97)80005-7. Ligtenberg, J. H., 2005, Detection of fluid migration pathways in seismic data: Implications for fault seal analysis: Basin Research, v. 17, no. 1, p. 141–153, doi:10.1111/j.1365-2117.2005.00258.x. Malamud, B. D., and D. L. Turcotte, 2006, The applicability of power-law frequency statistics to floods: Journal of Hydrology, v. 322, no. 1–4, p. 168–180, doi:10.1016/j.jhydrol.2005.02.032. Manzocchi, T., J. J. Walsh, and W. R. Bailey, 2009, Population scaling biases in map samples of power-law fault systems: Journal of Structural Geology, v. 31, no. 12, p. 1612–1626, doi:10.1016/j.jsg.2009.06.004. Mauldon, M., W. M. Dunne, and M. B. Rohrbaugh, Jr., 2001, Circular scanlines and circular windows: New tools for characterizing the geometry of fracture traces: Journal of Structural Geology, v. 23, no. 2–3, p. 247–258, doi:10.1016/S0191-8141(00)00094-8. Mykura, H., and B. P. Hampton, 1984, On the mechanism of formation of reduction spots in the Carboniferous/Permian red beds of Warwickshire: Geological Magazine, v. 121, no. 1, p. 71–74, doi:10.1017/S0016756800027965. Odling, N. E., P. Gillespie, B. Bourgine, C. Castaing, J. P. Chiles, N. P. Christensen, and E. Fillion, et al, 1999, Variations in fracture system geometry and their implications for fluid flow in fractured hydrocarbon reservoirs: Petroleum Geoscience, v. 5, no. 4, p. 373–384, doi:10.1144/petgeo.5.4.373. Pickering, K., D. Stow, M. Watson, and R. Hiscott, 1986, Deep-water facies, processes and models: a review and classification scheme for modern and ancient sediments: Earth-Science Reviews, v. 23, no. 2, p. 75–174, doi:10.1016/0012-8252(86)90001-2. Plink-Björklund, P., and R. J. Steel, 2004, Initiation of turbidity currents: Outcrop evidence for Eocene hyperpycnal flow turbidites: Sedimentary Geology, v. 165, no. 1–2, p. 29–52, doi:10.1016/j.sedgeo.2003.10.013. Pritchard, D., and C. Gladstone, 2009, Reversing buoyancy in turbidity currents: Developing a hypothesis for flow transformation and for deposit facies and architecture: Marine and Petroleum Geology, v. 26, no. 10, p. 1997–2010, doi:10.1016/j.marpetgeo.2009.02.010. Rohrbaugh, M. B., Jr., W. M. Dunne, and M. Mauldon, 2002, Estimating fracture trace intensity, density, and mean length using circular scan lines and windows: AAPG Bulletin, v. 86, no. 12, p. 2089–2104, doi:10.1306/61EEDE0E-173E-11D7-8645000102C1865D. Sinclair, H. D., and P. A. Cowie, 2003, Basin‐floor topography and the scaling of turbidites: Journal of Geology, v. 111, no. 3, p. 277–299, doi:10.1086/373969. Talling, P. J., 2001, On the frequency distribution of turbidite thickness: Sedimentology, v. 48, no. 6, p. 1297–1329, doi:10.1046/j.1365-3091.2001.00423.x. Walker, R.G., 1978, Deep-water sandstone facies and ancient submarine fans: Models for exploration for stratigraphic traps: AAPG Bulletin, v. 62, no. 6, p. 932–966, doi:10.1306/c1ea4f77-16c9-11d7-8645000102c1865d. Willmot Noller, N., and S. Daly, 2014, The contribution of heat production studies to geothermal exploration in Ireland (abs. ): European Geosciences Union General Assembly 2014, Vienna, Austria, April 27–May 2, 2014, 1 p.
Yang, Y., and A. C. Aplin, 2007, Permeability and petrophysical properties of 30 natural mudstones: Journal of Geophysical Research: Solid Earth, v. 112, p. 1978–2012, doi:10.1029/2005JB004243. Yielding, G., B. Freeman, and D. T. Needham, 1997, Quantitative fault seal prediction: AAPG Bulletin, v. 81, no. 6, p. 897–917, doi:10.1306/522b498d-1727-11d7-8645000102c1865d. Zhao, C., B. E. Hobbs, A. Ord, P. Hornby, S. Peng, and L. Liu, 2007, Mineral precipitation associated with vertical fault zones: The interaction of solute advection, diffusion and chemical kinetics: Geofluids, v. 7, no. 1, p. 3–18, doi:10.1111/j.1468-8123.2006.00156.x. This work was funded by Nuclear Decommissioning Authority (NDA) through the Engineering and Physical Science Research Council’s Cooperative Awards in Science and Technology award GR/T11340/01. The authors would like to thank Keith Ingham for introducing us to the field area and providing excellent base maps and Simon Norris from the NDA for support and patience during Alistair McCay’s Ph.D.